The left-leaning, Boulder, Colorado-based Public News Service published a story on June 14 accusing those in opposition to the proposed Bears Ears National Monument of using false information, veiled threats, and intimidation to turn San Juan County, Utah residents against the proposal. “Groups advocating national monument status for the Bears Ears region of Utah say opponents are using false information and veiled threats to intimidate local residents. 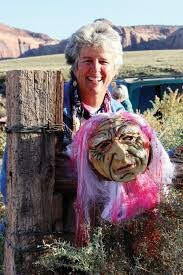 Gavin Noyes is fully aware that it’s not people opposing the proposal who are using hateful tactics to intimidate locals, but rather the groups, including out-of-state special interests, who are advocating for the Bears Ears designation as a national monument. 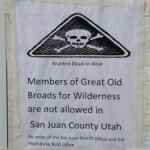 According to the following Twitter post, a group of environmentalist supporters of the proposed national monument was caught red-handed placing hateful flyers in public places in an attempt to make it look like opponents of the Bears Ears proposal were threatening Colorado hikers. 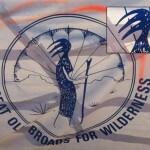 The owner of the Twitter account identified the group as “Great Old Broads for Wilderness,” and apparently Great Old Broads have pulled similar dirty tricksand staged misleading and hateful media events against their opponents several times in the past. The following pictures are from other incidents reported by Great Old Broads to local authorities, in which they said someone was threatening them. Suspiciously, this group always seem to be in the first to turn these items in and file the reports. Another group advocating for the designation of the Bears Ears is “The Friends of Cedar Mesa”. 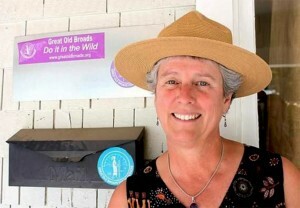 It should be noted that The Great Old Broads for Wilderness Asst Director Rose Chilcoat is also a Board of Director for The Friends of Cedar Mesa which aids both groups in their efforts. 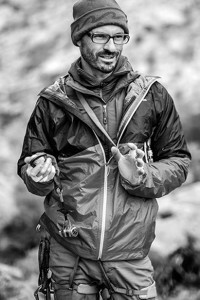 Friends of Cedar Mesa’s Executive Director Josh Ewing started a campaign a few weeks ago fighting against the completely fabricated problem of ‘looting’ on Cedar Mesa. The organization went as far as to offer a $2500.00 dollar reward for information leading to the conviction of anyone seen looting. They used the angle that major sites are being looted and destroyed to persuade the public that the Bears Ears designation is necessary to protect the sites in question. The facts, however, contradict the claims of Friends of Cedar Mesa, and show the instances they used as examples were not identified as “looting” by local authorities, and that very few cases of actual looting have occurred within the last five years. The truth is that The Friends of Cedar Mesa and other environmentalists advocating for a new national monument are the ones using false information and spreading rumors to push for the Bears Ears designation. Historically, such tactics are commonly used by these environmentalist groups. They use the media to manipulate the truth and promote their agenda, and feed the public totally false information to engender fear, or rage, or both. And, it appears they are at it again with the inflammatory and specious article in the Public News Service — UT.